This entry was posted in Books, Reviews and tagged book review, books, brandon sanderson, fantasy, mistborn. Bookmark the permalink. I’ve been meaning to give this one a go for a while, and after this great review I’ll have to bump it up to the top of my TBR list! Cheers! Hope you enjoy it! I certainly think it’s worth bumping up on your TBR! I have heard how good this book is, so it’s fantastic to get such a comprehensive and glowing review from you too! I will definitely read this – it’ll be exciting to immerse myself in the world! I think you would really enjoy it, Charlene! I finally finished the trilogy in December, and it was every bit as good as you say. One of the best, if not the best, endings to a fantasy trilogy that I have ever seen. And can I just say that I really want hardcover editions with the e-book art you posted? SO much better than the original covers. I’m looking forward to reading the second and third book, so glad you loved them! The cover art I posted is actually the same as the paperback I got, though as far as I know they don’t have those covers in hardback. Nice, I thought it was only for the e-book version. Oh my gosh, EVERYONE has read Brandon Sanderson except me. (Okay, that may be an exaggeration but my boyfriend has read his books so I feel like a total slacker :P) I think my main hesitation right now is how big it is, and seeming how I’m only reading like ten pages a day right now a 600+ page book just doesn’t seem possible. But I do plan on reading one Sanderson book before the year ends, just need to decide if it’s going to be one of these big epic fantasies everyone raves about or one of his smaller books like The Rithmatist or Steelheart. Decisions, decisions. I liked Steelheart well enough, but this was on another level. However, I totally understand the hesitation with wanting to read something so long, especially when you’re not able to read a lot right now. I’m not sure if I’ll ever be at the point where I’ll feel like I can read his 1000+ page books. I would maybe recommend to you one of his shorter books for now, but definitely keep in mind Mistborn for a day when you might have more time to read it, because it’s worth it! i just finished reading this as well & i feel like i have a book hangover! i cannot wait to read the next one (& i’m also wondering why i didn’t just buy the whole series). i’ve also got STEELHEART on my tbr list, but this one was definitely a good introduction into the magic that is brandon sanderson. Yeah, I had to read Harry Potter and The Goblet of Fire next to ensure I didn’t suffer from a bad book hangover! But like you, I was so sad I didn’t have the next two books already! I have Well of Ascension and Hero of Ages is one its way here, I just have to decide when in the next few months I’ll be ready to dedicate time to read both books back to back! I only have a few pages left to read of this book. I love it! I understand what you mean about it being a little slow; but it’s not a bad slow. It just flows well and takes you along on their journey. And, yes it isn’t all happy towards the end; I saw it coming and was hoping that it wouldn’t. I really like the relationships in the book and I’m glad that Vin learnt to trust more. I can’t wait to read the next two! I agree, it’s definitely not a bad slow. So glad you loved it too! 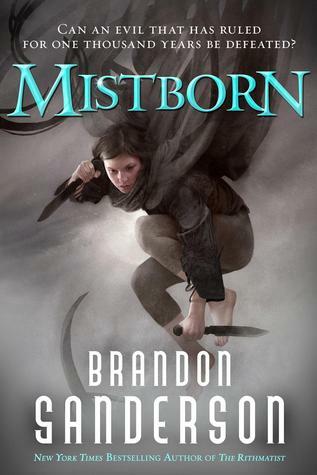 I recently read Mistborn and it is as wonderful as you said- a perfect dystopian book according to me! I have already started the second book and it’s great too.